Handout photo taken with permission from the twitter feed of @slopezserra of smoke pouring from Notre Dame Cathedral in Paris, which is on fire. PRESS ASSOCIATION Photo. Issue date: Monday April 15, 2019. See PA story FIRE NotreDame. Photo credit should read: @slopezserra/PA Wire NOTE TO EDITORS: This handout photo may only be used in for editorial reporting purposes for the contemporaneous illustration of events, things or the people in the image or facts mentioned in the caption. Reuse of the picture may require further permission from the copyright holder. Handout video grab taken from the Twitter feed of @leistomania93 of smoke and flames coming from the roof of Notre Dame Cathedral in Paris. PRESS ASSOCIATION Photo. Issue date: Monday April 15, 2019. See PA story FIRE NotreDame. Photo credit should read: @leistomania93/PA Wire NOTE TO EDITORS: This handout photo may only be used in for editorial reporting purposes for the contemporaneous illustration of events, things or the people in the image or facts mentioned in the caption. Reuse of the picture may require further permission from the copyright holder. German Chancellor Angela Merkel called the cathedral a "symbol of France and our European culture". 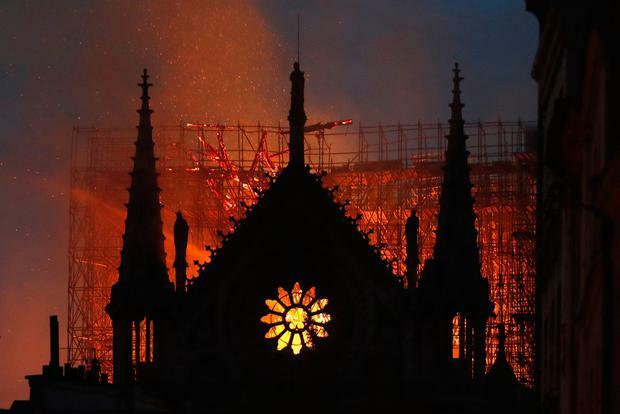 British Prime Minister Theresa May said her thoughts were with the French people and emergency services fighting the "terrible blaze"